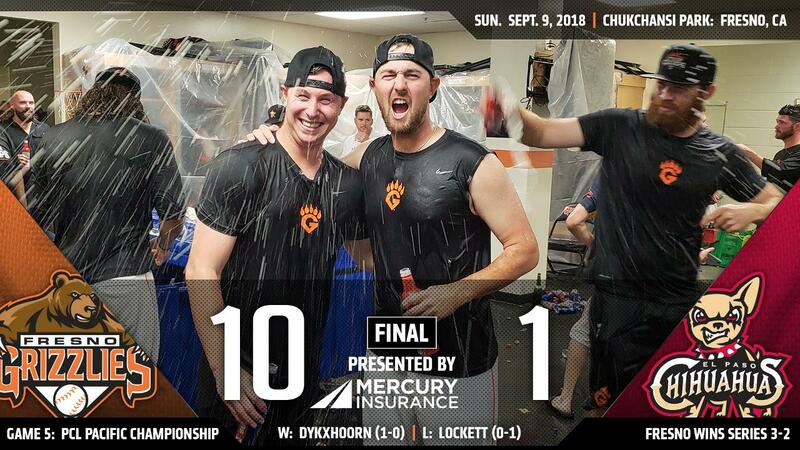 In front of a crowd of 7,588, the Fresno Grizzlies (3-2) hammered the El Paso Chihuahuas (2-3) 10-1 in game five of the PCL Pacific Championship Sunday evening from Chukchansi Park. With the victory, the Grizzlies advance to the PCL Championship Series versus the Memphis Redbirds. Fresno reaches the second round of the postseason for the second time in team history (2015). The club in 2015 won the Triple-A title. El Paso grabbed a 1-0 lead in the top of the second when Raffy Lopez looped a single to center, plating Shane Peterson. That would be the only run for the Chihuahuas in the contest. A three-run bottom of the third gave the Grizzlies a 3-1 advantage. Kyle Tucker (2-for-4) knocked in a pair with a single to right. Then, a double play netted Myles Straw. The lead would rise to 5-1 in the bottom of the fourth. Drew Ferguson (2-for-4) slapped a double to left, inching Nick Tanielu (3-for-4) across the plate. Then, Yordan Alvarez (2-for-3) waltzed home on a deep sacrifice fly to left by Alex De Goti. Alvarez and Garrett Stubbs (2-for-4) extended the lead to 8-1 in the bottom of the sixth. A rocket double to right by Alvarez notched Tanielu. With two hits, Alvarez lengthened his current team-high streak to 10 games (includes regular season and playoffs). Stubbs followed the double with a homer two batters later. It was a two-run blast to right-center field, his first of the postseason. AJ Reed expanded the advantage to 10-1 in the bottom of the seventh. He plastered a two-run clout to right-center field. It was also his first of the set. Up by nine, Brendan McCurry secured the win with a perfect ninth. Brock Dykxhoorn (1-0) enjoyed the victory after five innings of one-run ball. He was charged with three hits, two walks and five strikeouts. On the other side, Walker Lockett (0-1) suffered the loss. He lasted three frames, allowing three hits, three runs (earned), one walk and four whiffs. Four bullpen pitchers for Fresno hurled four shutout innings, fanning four. With 13 hits, the Grizzlies improved to 52-12 when pounding out 10-plus hits and 6-1 in the fifth game of a series. Fresno and Memphis begin their best-of-five playoff set Tuesday night from Chukchansi Park. First pitch is scheduled for 7:05 PT. Righty Brady Rodgers (0-0, 11.25) gets the nod for the Grizzlies while the Redbirds counter with RHP Kevin Herget (0-0, 1.80).